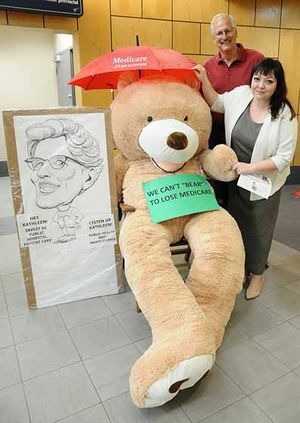 Members of the Ontario Health Coalition arrived at Thunder Bay City Hall carrying an enormous teddy bear that has become the emblem of their Ontario tour to draw attention to health care privatization. Mehra said they loved the idea and purchased a bear which they are taking across Ontario. Mehra added that many of these patients are elderly and are being charged thousands of dollars for needed services. All ‘needed’ health care has to be provided without extra user fees for patients. Some of these services include audiology, physiotherapy, speech pathology, cataract surgeries, and diagnostic MRIs and CT scans. Mehra alleges that these private clinics, many of them set up in wealthy neighborhoods in large urban centres, are double-dipping by charging their patients for their service and collecting fees from OHIP as well. “OHIP is paying these doctors in these (private) clinics and they are charging patients as well. They are double-dipping,” she said. So why does the patient go to these expensive clinics? “People are going to these clinics to be ‘exclusive’ and because health care services have been cut drastically or curtailed — patients have long waits for these services,” she said. Mehra said the upselling convinces patients that private clinic procedures are much better than outdated procedures supported by OHIP at your regular doctor’s office or at the hospital. And to add to the pressure, the patient’s doctor is actually referring them to private clinics and will even exaggerate (the length of) wait lists. “But they have a choice to go to public hospital,” stressed Mehra.